Tag Archives for " open country "
Whether you are camping, trekking, hiking or looking for food storage for even regular basis, the Open Country FD-1022SK Gardenmaster 1000-Watt Digital dehydrator is just what you need. Made for meeting the food storage needs of those who are adventurous and passionate about health and nutrition, the Open Country dehydrator is an investment any budget conscious customer will not hesitate in making. 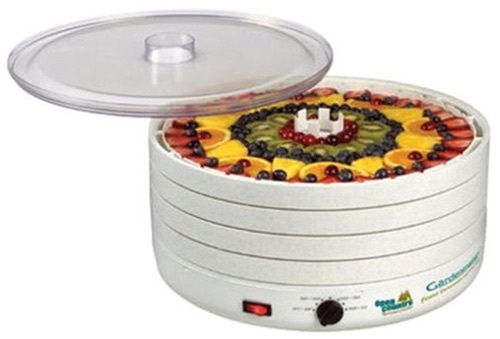 With a drying power wattage of 1000W and a 2400 RPM motor powering air circulation using the patented Converga-Flow technology, dry fruits, vegetables, liquids, semi-liquids, herbs, seeds and more in this handy dehydrator. Each tray gets a uniform supply of air that is fresh and dry through the even radial and horizontal distribution of this remarkable air flow technology. One more brilliant dehydrator in the collection of our website i.e. Open Country Gardenmaster FD 1010SK 1000 Watt Dehydrator! Let’s have a quick overview about this appliance. Do you know that “Open Country” is one of the top manufacturers in the category of the kitchen appliances? Well, this famous company mainly produces fishing and camping equipment (like food dehydrator) and it also creates kits of the jer﻿ky spices. All this simply shows that this company truly contemplates about food storage and supply.